Photo © Ewan-M, used under cc-by-sa. Corn with salted egg yolk (鹹蛋黃玉米粉) is a dish I only learned about recently, at a dinner at Sichuan Restaurant in Acton with Su-Lin and a few other friends and food bloggers. This restaurant is Su-Lin's local, and she insisted on us ordering this dish — it was really very very tasty indeed. The photo above was taken by ewan on that occasion. I was excited to realise a week or so later that my local Chinese restaurant had the very same dish on its menu — sadly, it turned out to be greasier and not as good. 鹹蛋黃玉米粉 only includes a handful of ingredients — sweetcorn (fresh, canned, or frozen), egg white and cornstarch to coat the sweetcorn, oil for frying, the yolks of salted duck eggs, a few bits of spring onion, and optionally some rice wine to flavour the egg yolks. 玉米 (yù mǐ) is sweetcorn. 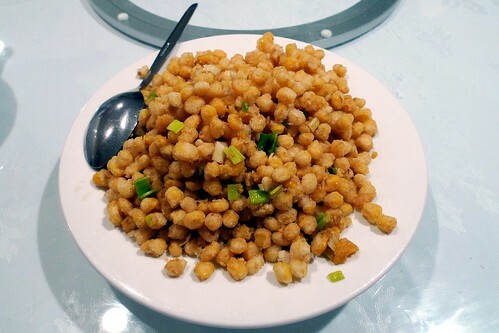 The 粉 (fěn) character in the name of the dish refers to the cornstarch coating, and is sometimes omitted, so you may see this dish listed simply as 鹹蛋黃玉米 (xián dàn huáng yù mǐ). Beware the pitfall of attaching the 粉 character to the 米 (mǐ) character and assuming that the dish includes 米粉, or vermicelli — it doesn't. The 米 is part of 玉米 and the 粉 stands alone. Salted eggs (鹹蛋/xián dàn) are not the same thing as century eggs (皮蛋/pí dàn, literally "skin eggs"). 鹹蛋 are simply duck eggs that have been left to sit in brine for around 40 days. As the salt works its way inside the egg, the white becomes salty (though remains liquid) and the yolk gradually solidifies. Unlike 皮蛋, which can be eaten as-is, 鹹蛋 need to be cooked before you eat them, usually by steaming. Often, only the yolks (蛋黃/dàn huáng, literally "egg yellow") are eaten, and you can sometimes buy these already separated from the whites. If not, just buy the eggs whole, and separate them as you would normally separate an egg. The interweb doesn't seem to have very much information about 鹹蛋黃玉米粉 available in English. 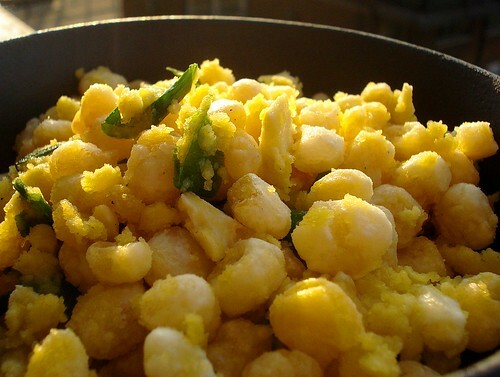 The only English-language recipe I've managed to find is this one from the GoKunming website, which also offers an alternative name for the dish — 金沙玉米, or jīn shā yù mǐ, literally "golden sands corn" — and states that the recipe is a Yunnan specialty (Kunming being the capital of Yunnan province). I found that the recipe as written was not very successful. My first batch, done according to the instructions, was a greasy, starchy mess that went straight in the bin. The second batch was better; I doubled the oil (you're essentially deep-frying the corn, so the more oil you have, the less the temperature will drop when you add the corn) and made sure to shake the hell out of the cornstarch-coated corn grains before putting them in the wok, to remove all excess starch. The third batch was even better; I took a tip from this video (in Chinese with partially-obscured Chinese subtitles) and coated the sweetcorn in a little egg white before tossing it with cornstarch, leaving it to sit for a few minutes, then shaking off the excess as before. My fourth attempt involved giving the (canned, drained, and dried) sweetcorn an initial light coating of cornstarch, shaking off the excess, mixing in some egg white, giving it another, heavier coating of cornstarch, letting it sit for a while, then shaking off the excess again. I also increased the number of salted egg yolks from 3 to 4, and added a small pinch of salt along with the rice wine. This was my most successful attempt so far, and although it wasn't quite as good as the version pictured at the top of this post, it was pretty damned good, so I decided to leave the experiment there before I completely lost the desire to ever eat sweetcorn again. Luckily, there was enough sunlight left for me to get a nice shot of version four, on the walkway outside my front door. If you have any questions or corrections, please leave a comment and let me know (or email me at kake@earth.li). See here for what these posts are all about. Looks lovely. Thank you for your research. As you know, I gave up after only one try that like yours went straight to the bin. With your tips I might try again. Robin. All four versions in the same day? There's no way of knowing which characters attach to which and which don't, except for experience, is there? Thank you for posting these, I've been much enjoying reading them. Not all in one day, no, I'm not quite that dedicated :) The first two were on the same day (within minutes of each other, in fact — the first one was such a failure that I was determined to try again before I lost my nerve), the third was a couple of days later, and the fourth was a couple of days after that. I'm afraid there isn't, as far as I know. Very glad to hear you've been reading and enjoying! I think that looks really very good! And that is some serious dedication to the dish! I have scoured the internet for this recipe. Have you been able to perfect it at all? This is the only dish I haven't been able to find the recipe to, nor find in any restaurants- yet. I haven't tried it recently, though you've given me the motivation to try it again! My most successful attempt was the one where I gave the sweetcorn an initial light coating of cornstarch, shook off the excess, mixed in some egg white, gave it another heavier coating of cornstarch, let it sit for a while, shook off the excess again, and then deep-fried it in plenty of oil. I think the key is to make sure the corn isn't wet at all before you deep-fry it. You could also try Lizzie Mabbott's recipe.